I’ve got a fair few products to review in my backlog, so I’m going to try to get these out to you every week or two until I am caught up. This week, I’ve got Tosa Tool’s (Dan Bye’s company) TTS Compatible Tool Mount. 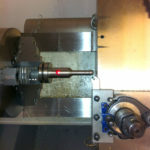 It’s an ER Collet Chuck Tightening Fixture. In fact, both of those names are a little too pedestrian for this device because it is nothing short of a complete TTS ER Collet Workstation. 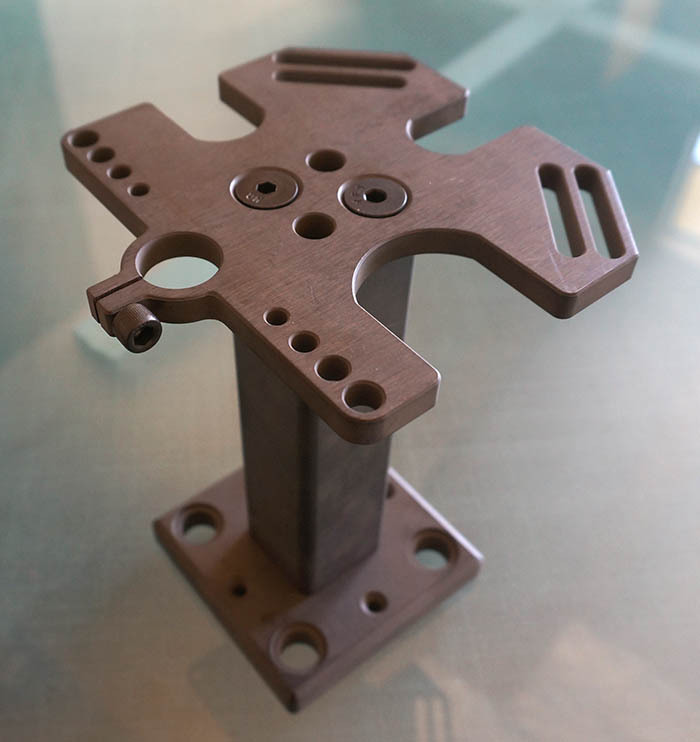 Like all of Tosa’s products, the TTS Compatible Tool Mount is extremely high qualilty. It’s made from 4140 Pre-Hard, which means excellent durability and resistance to scratches and nicks. It has a good-looking Black Oxide finish to resist rust and corrosion. But most importantly, every square inch is covered with useful functions. 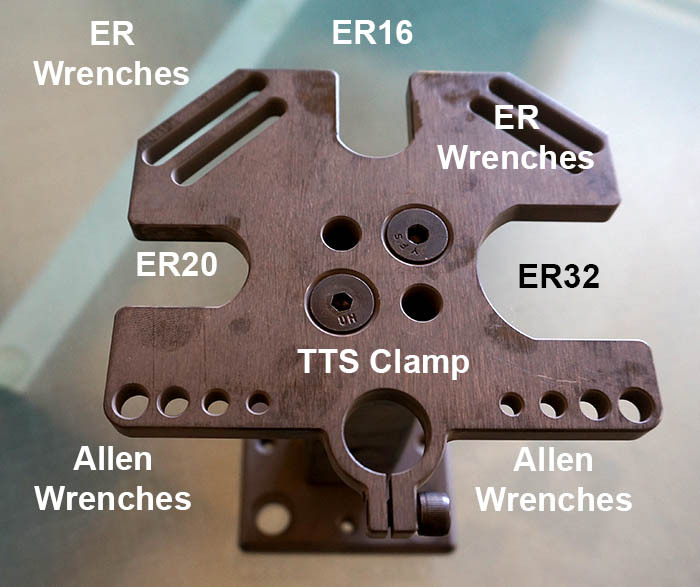 Storage for your ER, Allen, and Torx Wrenches that are needed to work on your TTS Holders. 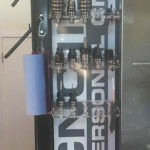 ER16, ER20, and ER32 slots compatible with the wrench flats on these holders. 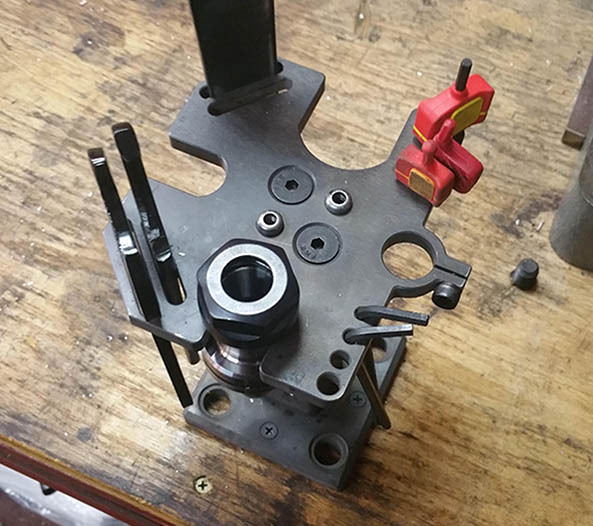 A TTS clamp so you can work on holders that don’t have wrench flats, for instance to tighten a set screw holder or change the insert on your indexable tools. You can mount the Tightening System to your workbench. I have mine right next to my height gage and surface plate for a complete TTS tool setup solution. Dan Bye advises you can also bolt it down to the table on your machine, which might also be pretty handy. I did manage to find one ER Collet that didn’t fit, but I don’t think this is an issue with Tosa. It’s a cheap Chinese knock-off of the TTS holders and the wrench flat wasn’t thick enough to go on the fixture. Considering the thickness of the fixture, I suspect a lot of wrenches you’d want to use to tighten it without a fixture won’t fit either. This particular collet chuck also came without a collet nut. Not sure what the deal is with it, but all the other collet chucks from the same manufacturer (and they were all supposed to be the same thing so I am guess this one is defective) fit just fine. I’ve seen a lot of tightening fixtures before, but nothing like this. 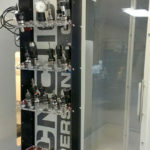 That’s why I call it a “Tightening Workstation.” With all the nifty slots for keys and so on, it’s puts everything you need for your task right at your fingertips in true Lean Manufacturing fashion. A tool this good has to have been a labor of love for its creator, Dan Bye. I haven’t heard this from Dan, but I am guessing he made his dream tool for his own use and then decided to offer it to his customers too. I know I love mine because it solves an annoying problem–trying to use two wrenches to tighten the darn collet chuck–very elegantly. You know what I mean if you use the two wrenches and have no tightening fixture. You’ll wish you had three arms and you’ll curse every time you can get enough leverage or the wrench slips off. By the way, do you know the technical reasons why just using two wrenches isn’t such a hot idea? 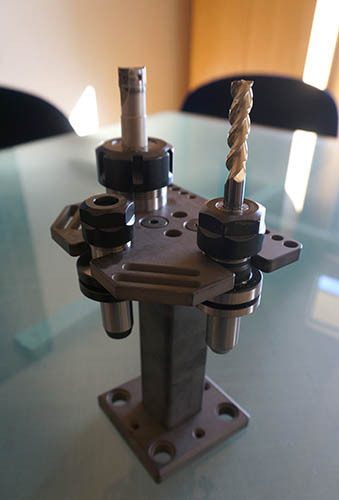 It’s not just a convenience issue, it matters for the proper function of the ER Collet system. Check how beefy that CAT40 fixture is–you want some MEAT on your tightening fixture so you can get after tightening that nut properly. 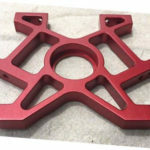 We give you a lot more detail on how to do this in our article on how to get the best performance from your ER Collet Chucks. They are an excellent workholding solution, far superior to setscrew holders, but folks that don’t see the value are often having problems from not tightening them properly. 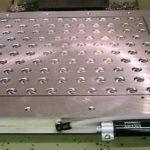 Take a look at Tosa’s unique TTS Tightening Fixture. 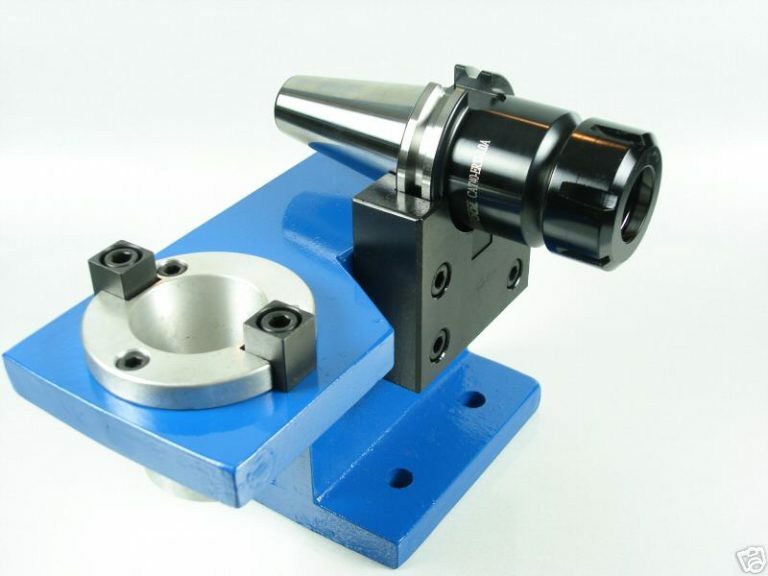 At $163.85, it’s not inexpensive, but you’ll use it just about every time you use an ER Collet Chuck with your Tormach, and you’ll find you just can’t live without it after a very short time. If you compare prices with nice CAT40 fixtures, it’s pretty similar, except the Tosa setup just does a lot more. 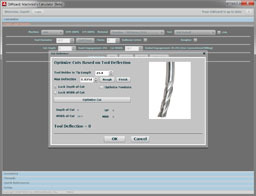 It’s a great tool for any Tormach shop! 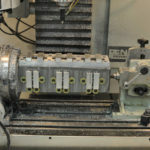 How Do Tombstones Increase Your Work Area on a VMC With 4th Axis? Upcoming CNCCookbook Product Reviews: Good Stuff! 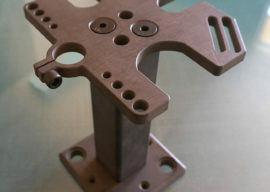 Looks handy, but I am not sure I would attach it to the table with just four little screws, they are in a position where torque could shear them or rip them out of the table. I would come up with a carriage bolt solution, preferably to a metal table top. Actually, they are big bolts on my bench. It’s mounted as you would a heavy vise. But my bench is so messy when I did this that I used that photo from Tosa’s site. The dual mounting solution is mine (as is the rest of the design), I will vouch for the wood screw option. 4 Good #8 Screws and this thing is down good. No play and I cranked the hell out of mine and it never flinched. The other option is for 1/2″ fasteners or my 562 locating bolts on my site. The locating bolts will secure them to the corner of your modular plate if you dont have another place to use it.